To showcase the endless research taking place at each Research Center, there will be numerous field days during the next several months. While each field day will feature the same great presentations about the research at the Centers, a new feature has been added to the field day season – a giving match of up to $500 per donor. From Aug. 1 to Oct. 31, CAFNR will match donations made directly to any of the Research Centers. That means a $250 donation, for example, would result in $500 overall to whichever Center the individual chooses. The University of Missouri College of Agriculture, Food and Natural Resources Agricultural Research Centers are spread throughout the state and conduct research on everything from corn to chestnuts to cattle to cotton. The Research Centers represent the uniqueness of agriculture in Missouri. With fertile soil, the Fisher Delta Research Center, located in the Bootheel region, studies numerous crops, including rice and cotton. In the northwest part of the state, the Graves-Chapple and Hundley-Whaley Research Centers research best management practices for corn and soybeans. At the Horticulture and Agroforestry Research Center, in central Missouri, multiple disciplines are explored, such as plant pathology and agronomy. Beef cattle reproduction and genetics research is conducted at the Thompson Research Center in the northern part of the state. To showcase the endless research taking place at each Research Center, there will be numerous field days during the next several months. The Bradford Research Center Tomato Festival will take place on Thursday, Sept. 6, in Columbia. While each field day will feature the usual informative presentations about research at each Center, there will be an added opportunity this year – a giving match of up to $500 per donor. From Aug. 1 to Oct. 31, CAFNR will match donations directed to any of the CAFNR Research Centers. That means a $250 donation, for example, would result in a $500 benefit to the selected center. “Our Research Centers play a vital role in the CAFNR mission by conducting timely and important research – and taking that research to our farmers and producers,” said Christopher Daubert, CAFNR vice chancellor and dean. “Each Research Center is vitally important in the communities where they are located. Donations can be made online by visiting the Mizzou Give Direct site and entering your Research Center of choice in the search tab. Donations can also be made in person during each field day event. The Bradford Research Center, in Columbia, will kick off the field day season with its Vegetable Grower field day on Thursday, Aug. 2. The Greenley Research Center, near Kirksville, will follow with its field day on Tuesday, Aug. 7. Graves-Chapple, near Rock Port, and Hundley-Whaley, near Albany, will both host field days on Tuesday, Aug. 28. Graves-Chapple will begin at 8 a.m. with Hundley-Whaley starting at 5 p.m. This will be the third year that Hundley-Whaley has used an evening format with its twilight tour. The Fisher Delta Research Center, near Portageville, will host its field day on Friday, Aug. 31. 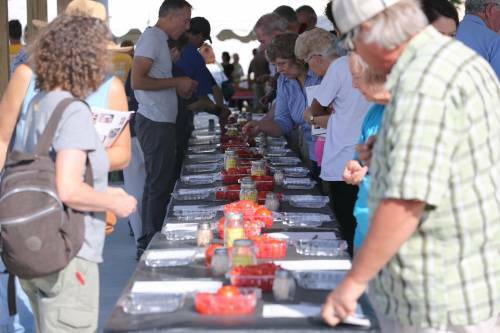 The Bradford Research Center Tomato Festival will follow a week later on Thursday, Sept. 6, in Columbia. The Forage Systems Research Center, near Linneus has years of research in forage production in northern Missouri and will showcase that research on Tuesday, Sept. 11. The Southwest Research Center, near Mt. Vernon, will move its field day to a weekday after two straight years of hosting it on a Saturday. Their field day will be Thursday, Sept. 13. Beef cattle production and issues will be looked at in-depth during the Thompson Research Center field day, near Spickard, on Monday, Sept. 17. This will be the second year that Thompson will have an evening field day with a farm tour. It begins at 3:30 p.m. The South Farm Research Center will celebrate its 12th Showcase on Saturday, Sept. 29. The South Farm Showcase has grown each year, and had more than 16,000 in attendance last year. Jefferson Farm and Garden will also be part of the South Farm Showcase again this year. The Wurdack Research Center, in the Ozark hills, combines numerous production aspects, including programs to improve forage, beef, agroforestry and timber. The Center will host its field day on Friday, Oct. 5. At HARC, near New Franklin, the annual Chestnut Roast will be back, returning on Saturday, Oct. 6. For more information about each of the CAFNR Research Centers, visit cafnr.missouri.edu/research/centers/.